At the game last night we got a Padres sticker to add to the National League side of the car. Dad put it on right after the game before we even left the parking garage, but I did not get around to taking a photo of it until this morning. 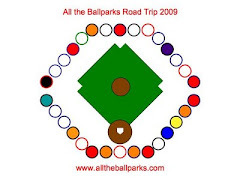 I still forgot to take a photo of the lettering on the back of the car, but it is basically just the All the Ballparks 2009 Road Trip lettering because Dad messed up on one side and when he ordered new lettering it came with two sets of it. Update: I now realize it is kind of hard to tell with the little thumbnail photo that it is there above the red Dbacks one. It is clearer if you click on the photo to see the larger version of it. The Padres one is actually pretty fancy in comparison to the simple Dbacks one.